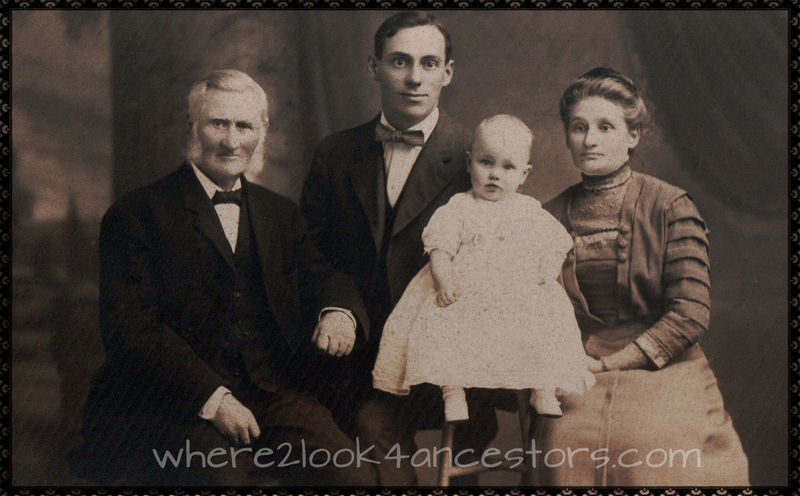 I love seeing pictures of my ancestors and multiple generation shots are my favorites. Four generations in the same professionally posed portrait are a rare find. That’s what makes this photograph so special. The baby in the picture is my grandmother Harriette Kathlyn Tolf born 02 Jul 1909. She’s posing with her father Harry Wilhelm Tolf (1884-1964), her grandmother Augusta Sophia nee Landstrom Tolf (1858-1936), and her great-grandfather Johan Peter Landstrom (1824-1918). Augusta was born on this day in 1858 in Norra Sandsjö, Jonkopings, Sweden. She and her parents and her siblings all traveled to the United States at different times. They appear to have immigrated directly to Chicago where Augusta lived most of her adult life. 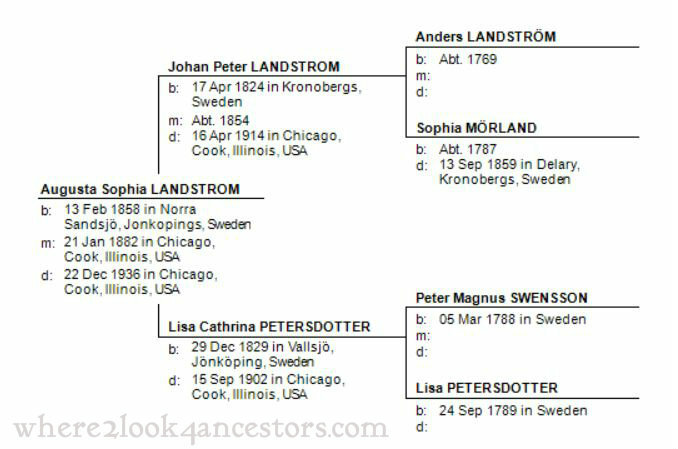 Augusta Landstrom married Peter Tolf on 21 Jan 1882 and they had three children; Harry, Ranghild, and Raymond. On the 22nd of December 1936, at the age of 78 Augusta died of diabetes. Interested in collaborating on Landstrom family history? I can be reached at where2look4ancestors [at] gmail [dot] com. My 2015 goal for Augusta is to determine when and with whom she traveled to the United States. My 2015 organizational goal for her is to bring all of her documentation from out-of-date to up-to-date on Ancestry, Dropbox, Family Tree Maker, and in her paper files. Your grandmother’s great-grandfather?! Wow, that is an amazing photo!!! Isn’t it? I’m so lucky to have it. Discovering family photos is my favorite part of family history research. A very nice photograph. These types of pictures are a family treasure. Thank you – I’m thrilled to share it! Yes, this is truly a rare photograph. Your presentation is informative and inviting. I commend you on your successful blog.